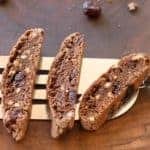 Biscotti are a sliced, twice-baked cookie. They are easy to make. The dough can be made ahead and baked later. They’re also good dunkers! Try milk, wine, coffee, or tea. Stir: together flour, cocoa, baking powder, baking soda, and salt. Set aside. Mix: cream the butter and sugar until well blended. Scrape sides and bottom of bowl with a rubber spatula to incorporate butter and sugar. Add eggs, almond extract and vanilla. Beat these until well blended. Add flour mixture and slowly mix all ingredients together. Blend in almonds and cherries. Bake: Heat oven to 350°F. Line two baking sheets with silicon liner or lightly spray with cooking spray. Divide dough in half. If dough is sticky, spread a couple teaspoons of flour on the counter. Place the dough out on the counter. Shape each half of dough into a log about 11-inches long and 2-inches wide. Place logs on cookie sheet, 3–inches apart. Bake 20-25 minutes, until they are firm to the touch and a toothpick inserted into the center comes out clean. Remove from oven, transfer log to a cooling rack. Allow to cool about 5 minutes. Reduce oven temperature to 325°F. Put log on a cutting board and slice across the log into ½-inch pieces. Place cut side up on cookie sheet and bake 15 to 18 minutes more. Cool on cooling rack. Cookies will crisp as they cool. Store in airtight container. To toast almonds: Spread almonds on a baking sheet. Place in cold oven, turn oven to 350°F. Bake almonds 8-10 minutes until lightly browned. Remove from oven, set aside to cool.